Village debates: do we tell visiting leaders of issues? 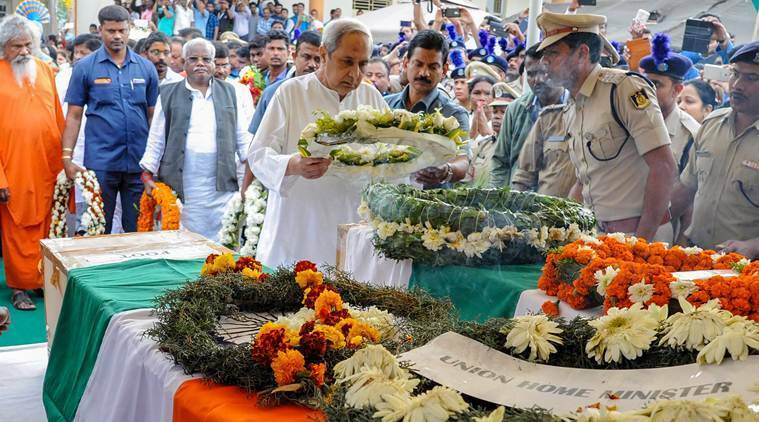 Behera, 32, and Prasanna Sahoo from Jagatsinghpur district are the two CRPF personnel from Odisha among the 40 killed in Thursday’s Pulwama terror attack. For residents of Ratanpur Mauja, in Odisha’s Cuttack district, the only electric light temporarily strung up outside Manoj Behera’s house marked the residence of the slain CRPF personnel. On Saturday, it also became a point of debate between war and development. Over the last two days, ministers and MLAs have been visiting Ratanpur Mauja, near the boundary of Puri district. Union minister Jual Oram, along Odisha CM Naveen Patnaik and Union minister Dharmendra Pradhan and several state ministers and political leaders from different parties, paid homage at the airport; Oram was among those who attended Behera’s funeral in Cuttack district — Pradhan went to Naugaon, in Jagatsinghpur district, to attend Sahoo’s funeral. With ministers, political leaders and officials visiting the village, residents have sensed an opportunity to talk about darkness enveloping the village’s lanes and public spaces. Young men in the village had planned to tell the politicians that they want a “befitting lesson for Pakistan”. Their animated discussions were interrupted by village elders. “Revenge is fine. But it comes at a cost,” an old gentleman sternly said. “We have a chance to highlight development issues before the galaxy of politicians. If there’s a war, government resources will be diverted,” he said.